Scott Gottlieb, who will step down as commissioner of the Food and Drug Administration on Friday, plans to return to the American Enterprise Institute to focus on drug prices — a hotly debated area that has been peripheral to his current job, he said in an interview. The 46-year-old physician, who has been commuting weekly to Washington from his home in Connecticut, said he plans to spend a half-dozen days a month in Washington as a resident fellow at the conservative think tank. Besides that, he said, he has no commitments for now other than taking his family to Disney World. Before becoming FDA commissioner in May 2017, Gottlieb was a resident fellow at the think tank, using his perch to write numerous op-eds for the Wall Street Journal and other publications. He also was a partner at a venture capital firm, held various board positions and consulting jobs for pharmaceutical and medical device companies, and worked as a hospitalist at the New York University School of Medicine. 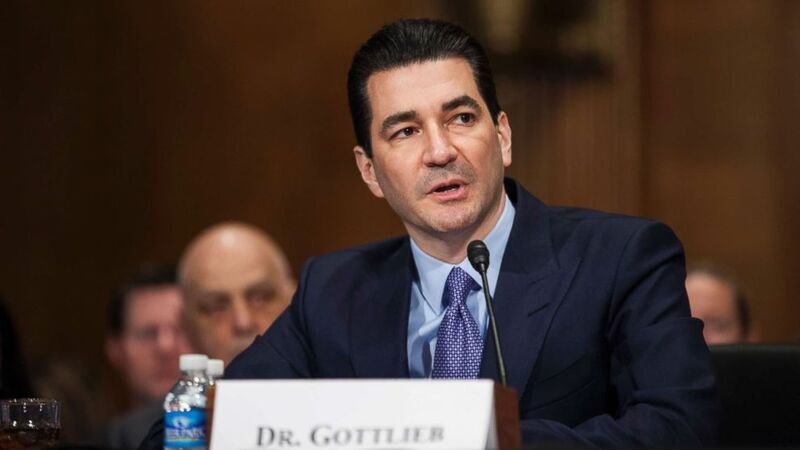 As commissioner, Gottlieb showed more interest than some of his predecessors in high drug prices — which is not part of the FDA’s portfolio — and pressed for faster approvals of cheaper generic drugs in an effort to increase competition and reduce costs. Gottlieb said he is especially interested in trying to figure out how to pay for innovative treatments — including gene therapies for diseases such as hemophilia and sickle-cell anemia — that will be administered to patients just once but could have lifelong benefits. Some of those treatments are likely to have price tags of several hundred thousand dollars or more. Gottlieb said he also wants to delve into “market failures” that are keeping pharmaceutical prices high. For example, in some classes of drugs there simply are not enough products competing with one another to constrain prices, he said. Some of that is the result of “gaming” by brand-name companies to keep generics off the market, he said. But there’s also new data that shows it is taking longer to bring a second drug in a particular category to market, especially for orphan drugs, or drugs that are underdeveloped because of their limited potential for profitability. As a result, the first drugs on the market are “monopolies in perpetuity,” he said. In other categories, Gottlieb said, there are enough products but not robust price competition because of various rules and structures. He pointed to Medicare Part B, which covers drugs administered in doctors’ offices and outpatient clinics. Payments for those drugs follow a specific formula, rather than being determined by competitive bidding, which would force down prices, he said. In some situations, he said, there is healthy price competition, but the discounts — rebates — secured by insurance companies aren’t used to help sick consumers. The insurers use the money to hold down premiums for healthy people rather than to help the cancer patient faced with big co-payments, he said. “It’s the exact opposite of what we expect from insurance,” he added. Reflecting on his FDA tenure, Gottlieb said he was most gratified by his efforts to change the agency’s perception of its role in big public health challenges, especially the opioid epidemic. It is now widely accepted within the agency, he said, that part of its mission is to try to decrease the rate of new addictions and to consider the potential for illicit use when considering new drugs. Gottlieb said he planned at AEI to write about FDA-related issues but intends to proceed carefully. “I don’t want to be on the sidelines causing grief for Ned” Sharpless, the National Cancer Institute director who is the incoming acting commissioner.